Needham Elementary School fifth-graders Annie Somrak, front, Raya Helfrich, left, and Fergus Huggins, back, prepare one of the garden’s 24 raised beds for winter on Wednesday afternoon. Somrak is the daughter of Jill and Mike Somrak; Raya is the daughter of Angela Helfrich; and Fergus is the son of Sam and Eric Huggins. 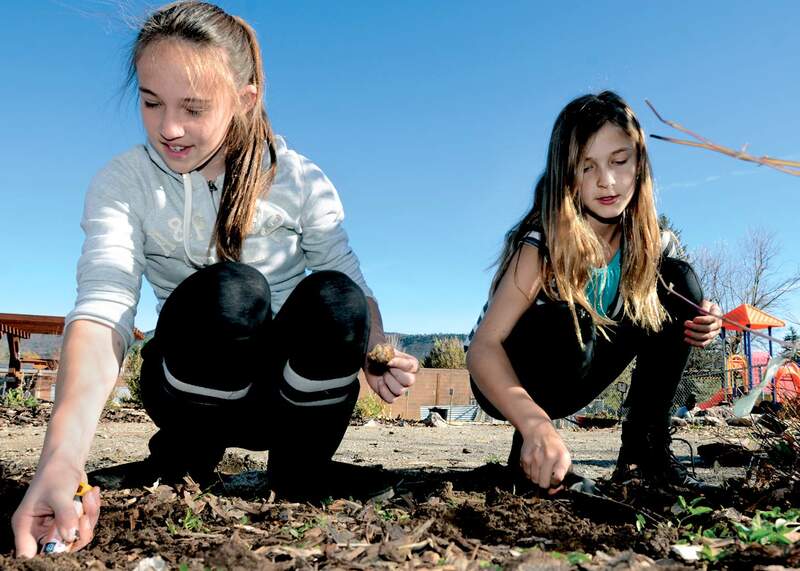 Needham Elementary School fifth-graders Raya Helfrich, left, and Diana Koshevoy plant Narcissus bulbs on Wednesday at the school. Raya is the daughter of Angela Helfrich. Diana is the daughter of Lana and Vlad Koshevoy. The realization that agriculture is a year-round endeavor came to the fore this week at Needham Elementary School during Farmer Days. Sandhya Tillotson, the executive director of the Garden Project of Southwest Colorado, was guiding students as they shut down growing beds for the winter. But Tillotson’s mind also was on the organization’s Nov. 13 fundraiser, which, with donations and grants, helps cover around $70,000 for activities and salaries of three staff members. Tillotson also counts on volunteers generous with their time to stretch her dirt-cheap budget. On Tuesday, students were pulling expended plant material from raised beds to add to a compost pile. They then spread llama manure on the beds, followed by a layer of leaves. Tillotson tried to coax the words nitrogen and carbon from the students as they spread the manure and leaves. They weren’t taking the cue as they eagerly focused on the task. The Needham growing area is one of the Garden Project’s three showcase programs. The others are the Manna Soup Kitchen Garden and the Ohana Kuleana Community Garden. The Ohana Kuleana garden has numerous shareholders, including Riverview Elementary School students, the Southwest Center for Independence and the Boys & Girls Club of La Plata County. 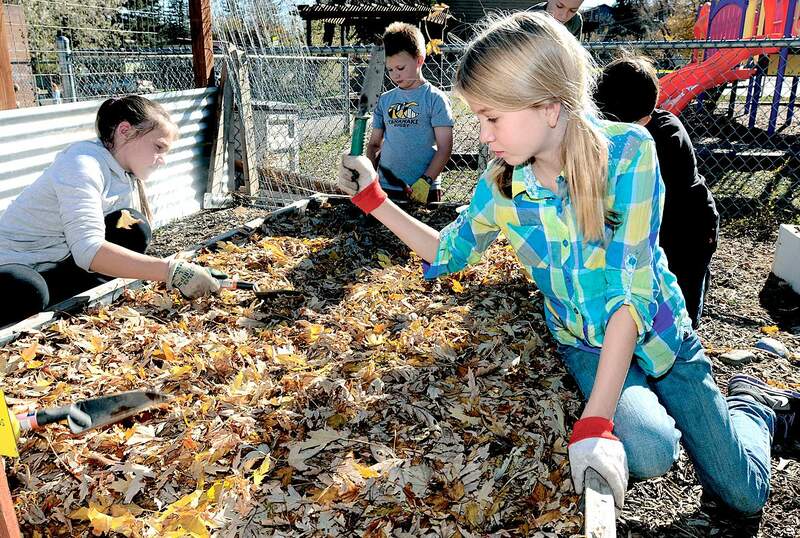 The Garden Project of Southwest Colorado has been around since 1998, and in that period, helped start 19 school and community gardens, Tillotson said. Beth Saren, a first-grade teacher at Needham, recalled how she and a lone parent started the garden eight years ago. “We started with eight beds of vegetables,” Saren said. “Then we brought in other classroom teachers and our PTO (parent teacher organization). We also got support from the farm-to-school movement, which was just getting started. Garden produce from 24 raised beds – one for each classroom in the kindergarten to fifth-grade school – ends up in the school cafeteria or as classroom snacks. A little finds its way into the Backpack Program, which sends food, largely canned, home with students in low-income families. No growing occurs in the winter, but food is never off the table, Saren said. In late winter, discussions begin about what worked and what didn’t work the previous season and what students want to plant come spring. Then there is the Dirt Club, which meets four weeks each in fall and spring to bring together art, food preparation and gardening. “The overall goals of the gardening is to connect kids with the source of their food and the cycles of nature,” Saren said. One Garden at a Time: A benefit for The Garden Project of Southwest Colorado, 5:30-7:30 p.m. Nov. 13, at Eolus, 919 Main Ave. Tickets $50. For more information, email sandhya@thegardenprojectswcolorado.org.